During the meeting they explained their issues and outlined the improvement initiatives they had in place. They wanted my help in closing the gap between the results they were getting and the results that were needed. As we listened to the leadership team’s plan for moving forward it became immediately clear to us that the problem they were trying to solve could not be solved with a bottom line improvement focus… yet this was where everyone’s thinking was centered. We were reminded that day that many of us are “victims” of the Lean era. For decades we have been working to improve our existing forms of value by driving waste from our systems. It is the practice we all know and since we’ve seen the results that can be achieved it is the first, and in many cases, the only option that is explored. Yet, some problems can’t be solved with a focus exclusively on the bottom line. Some issues require a top line focus. Top line growth, what we call Strategic Innovation, has its own well developed framework, tools and techniques for growing organizational profitability. For the metals manufacturer noted above, the method that best fit their need was Business Model Innovation. Business Model Innovation involves a collaborative process that visually renders the current business strategy, identifies new strategic positions, uncovers an innovative future state strategy, and defines the future state business model. The process of implementing Business Model Innovation involves carefully reviewing all nine building blocks of the business model… not just products and services, for the opportunity to leverage innovation. 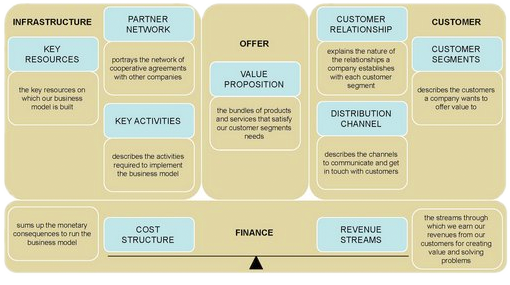 The illustration below shows what all the elements of the business model are and how they link to form the new value creation capability. Arriving at a clear conception of your present business model—one that’s shared by top-level executives and managers—is an important step in identifying opportunities for innovation. The act of simply bringing the existing model to light can spur ideas about new ways of going about your business that go beyond waste elimination. It can help you see opportunities for disruption that you (or your competitors) can leverage or in the case of the metal manufacturer, it can help you see ways to return to profitability.